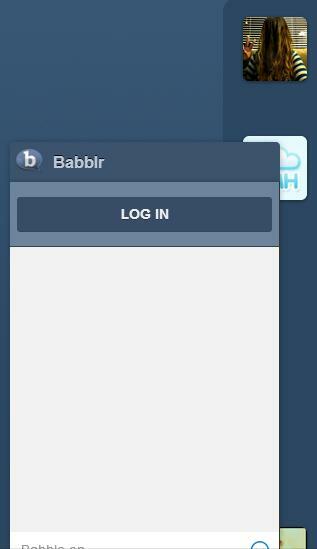 Since we first reported on third-party chat app Babblr for Tumblr, we’ve been keeping close tabs on its development, helping test features, and making sure all the Tumblr lovers out there know when it’s actually released. Given the pervasiveness of Tumblr, much of the Internet has been excited about the idea of being able to chat within the site. While Tumblr maybe used to be seen as a blogging platform, it’s transitioned into much more, a hybrid social network of sorts that is inherently very social, yet has no chat function … until Babblr, of course. Now, Babblr’s founders have finally announced the chat app’s release during a livestream announcement. Currently, Babblr is a three-man team: Clarke does the back-end programming, Sowers is in charge of PR and marketing, and Williams handles design. According to Clarke, he spent up to 50 hours a week coding Babblr, but expects it to dwindle down to 10-20 hours a week after official release. “This project is very dear to me, and I would love to continue as the sole developer, but as I see demand arise, we will be looking for more people to help. There are a few app fronts that we would like to hit, and this would not be possible in a reasonable amount of time with just myself [as the sole developer],” Clarke explains. 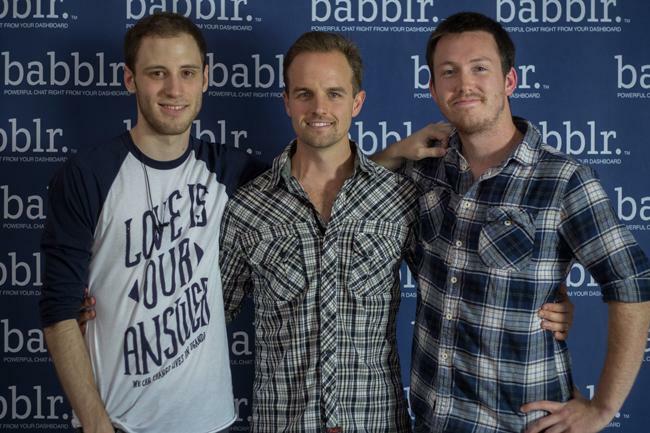 Aside from being Babblr founders, the trio also works for Sevenly, a weekly cause activation platform. 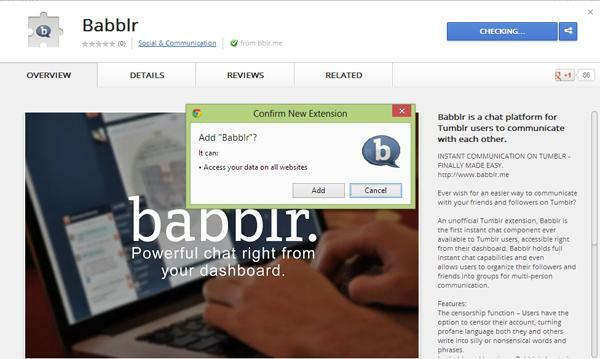 Find the Babblr extension in the Google Chrome Web Store (right now it’s not available for any other browser). You will need to confirm the extension to get it to work. Log into your Tumblr account. After a few moments, you should see a minimized Babblr tab on the bottom left of your dashboard. Clicking it will pull up the chat box. Click Log in. It will pull up a page asking you to grant Babblr “read and write” permissions – all that means is that you are allowing the app to grab some data that will populate your chat box, namely your username and Follower/Following lists. Babblr will neither collect your information for another purpose nor post things on your behalf. You can read their FAQ page to find out more about their limitations. Like other apps that go through beta testing, Babblr had a few kinks and glitches that we experienced during our hands on, but leading up to the launch, a lot of the issues were noted and resolved, which proves what we already know: App development is an ongoing process . The censorship function: Users have the option to censor their account and creatively turn profanity into gibberish. While some might say that this move to try and shield kids’ eyes from cuss words is useless and can easily be turned off, leaving it on provides valuable entertainment that’s almost irresistible – you might even unwittingly create new Tumblr slang. In-dashboard location: Babblr is located directly within Tumblr’s dashboard, making it easily accessible while perusing your feed. 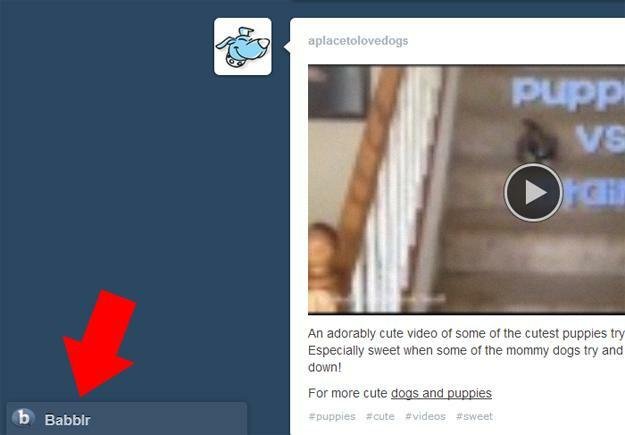 It is very unassuming – when you enter Tumblr, Babblr remains minimized at the bottom of the page to the left and will not pop up until you click it. 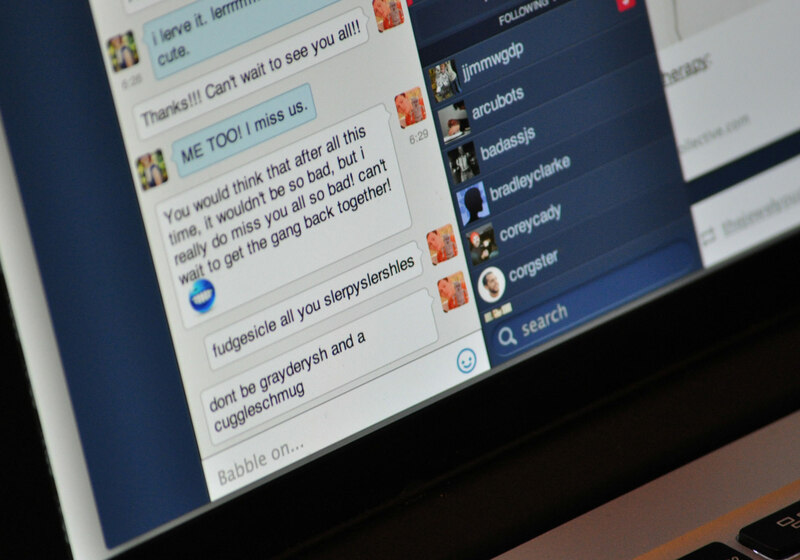 It’s specifically designed to not obstruct your view of your feed even while you chat. If you prefer not to multi-task, you can collapse your entire chat system and navigate through your Tumblr feed uninterrupted. 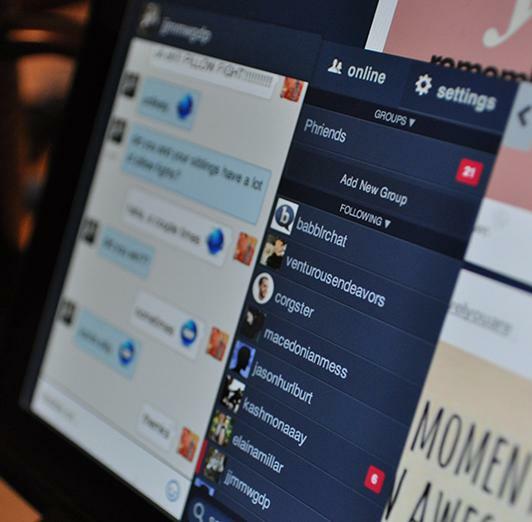 Chat capabilities: Users can initiate one-on-one chats or create up to 15 chat groups that allow multiple people to chat at once. Group creators or administrators have an added ability to add or remove members from the group chat. A few of us tested the group chat, and there were many things we liked about the function. First, we found it interesting that users can see a local timestamp underneath the avatar of every chat participant – different time zones become less confusing. Second, users can share links and even hashtags; clicking on a #kittens hashtag will initiate a search within Tumblr and provide you with a list of only super-cute cat posts. Beside the chat area is your chat list, which is populated with your Followers and the blogs you are Following. You can block users with a single click, but just in case you change your mind later on, you can keep tabs on those you’ve shunned through a hidden Blocked list (which will appear with your other two lists if you set it under Settings) and add them back. By default the chat lists include all the blogs you follow – in case you follow too many, you can use the Babblr Search bar to easily find users within your contacts. It’s also possible that a lot of your contacts don’t have Babblr installed; in that case, you can click on their name and an invitation will be sent into their Tumblr inbox. If you change anything within Tumblr, such as your profile photo or if you followed someone new, you will have to click on Update Account for the changes to reflect in Babblr. You don’t have to worry about data misuse because Babblr only stores up to 100 lines of chat before deleting them permanently. Notifications: You can turn sound notifications on or off in the Settings, depending on your preference. An additional notification in the browser tab also shows up, in case you’re busy checking Facebook working on something else. Other suggestions: Babblr only has one set of emoticons, pictured below; it would be great if users had more choices that befit their style and personality. Right now, every contact is listed with only a Block icon next to it – there’s no clear way of knowing if a user is already a Babblr user or not. An icon that indicates Babblr status can remedy this. It’s especially important to know which Babblr users are offline at the moment so we don’t keep chatting them up. Clarke mentioned that this particular feature is coming soon. It’s great that hashtags work within the chat; ideally, the next step would be to incorporate GIF compatibility, since Tumblr is the hang-out of choice for GIF aficionados. What lies ahead for Babblr? Clarke, Sowers, and Williams are personally bootstrapping Babblr, and after the launch, the app’s only source of funding will be provided by the users on a pay-what-you-want scheme. When asked about plans to get additional capital for the project, Clarke confirmed that obtaining funds to further the development of the product on several fronts is an option they are considering. As for additional features, Clarke assured us that more will be rolled out in the next few weeks. Aside from the online/offline status of each contact, functions to look forward to include Typeahead, for easier adding of a friend to a group, and Autoload, for grabbing the most up-to-date information from your blog. Babblr intends to be available on every Tumblr dashboard across various browser platforms. By doing this and then developing a mobile version, they hope to one day become fully integrated with Tumblr. They are targeting 2.5 million users by the end of the year, and by the looks of it, it’s a very attainable goal. Right now, new users are flooding the site, so if you’re trying to get access to the app today, you might experience some technical difficulties as the team attempts to deal with the very positive problem of too much attention.